With as many as 1 in 13 children in America diagnosed with a food allergy and many more who struggle with feeding issues, being aware of dietary restrictions can be a life or death situation at the holiday dinner table. Even when a child's issues do not result from a medical condition, the way family and friends respond to dietary concerns can make the difference between a comfortable, happy holiday and a situation that puts unnecessary stress on a child. Educating Family and Friends: Many families who struggle with food allergies bear the burden of constantly educating friends and family. 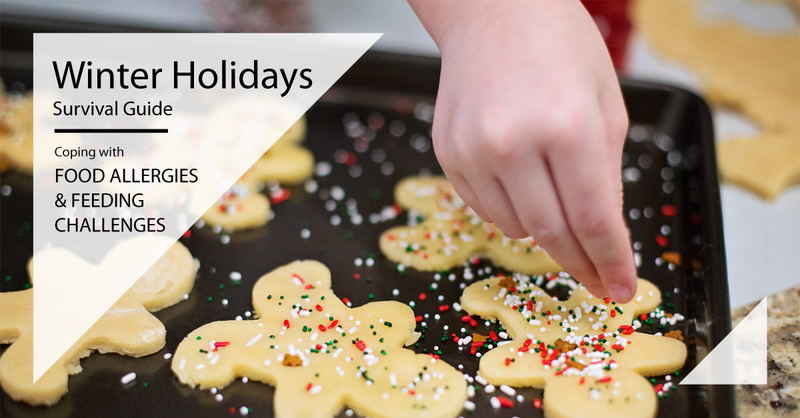 If you are new to celebrating the holidays with a food allergy, you can find some great information on creating a food allergy safety zone from FARE. FARE also offers educational information that families can use to help educate caregivers such as grandparents and extended family. Looking Out for Cross-Contamination: Let your host know about the dangers of cross-contamination and plan ahead for visitors coming to your home. Kids with Food Allergies offers some good tips for avoiding cross-contamination when guests are around. Offering to Bring a Safe Dish: Often, extended families want to help a struggling child but just don't have the knowledge to do so safely. By bringing a safe dish that everyone can enjoy, you can make your child feel welcome at the table and show everyone that allergy-friendly foods are nothing to be afraid of.